Cox’s Bazar, Dec 29 (Just News): Ruling Bangladesh Awami League general secretary Obaidul Quader on Friday said the next general elections would be held in due time even if its arch rival Bangladesh Nationalist Party (BNP) boycotts it. According to the existing constitutional provision, the 11th parliamentary polls are scheduled to be held either in late 2018 or in early 2019. “The authorities will wait for none in holding the next general elections. 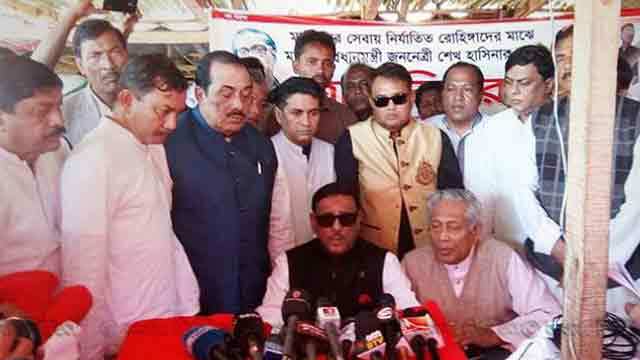 The polls will be held in time even if BNP boycotts it,” said Quader. Also the road transport and bridges minister, Quader was speaking to newsmen while visiting Rohingya camps in Kutupalong of Cox’s Bazar. Dwelling on the repatriation of Rohingyas to their homeland, Myanmar, the minister said prime minister Sheikh Hasina-led government would “send Rohingyas back to their country as quickly as possible”. He said the government would hand over a list of 100,000 Rohingyas to Myanmar on Friday for their repatriation. He claimed that the joint working group - a committee comprising representatives from Bangladesh and Myanmar towards the end of returning Rohingyas - are working in association with international committee including the United Nations to send back the Rohingyas. About 650,000 Rohingyas - an ethnic group of Myanmar - escaped repression and tortures carried by Myanmar military and its collaborators took refuge in Bangladesh since 25 August this year.